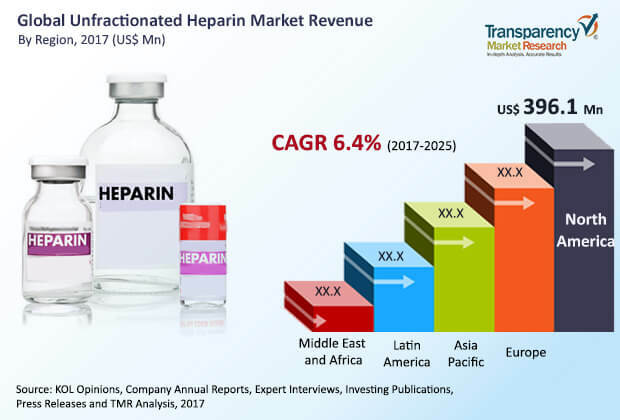 The largely consolidated vendor landscape of the global unfractionated heparin market features several large international companies and a handful of well-established local players operating in promising regional markets, states Transparency Market Research in a recent report. To gain a larger control on the market, companies are putting more emphasis on strategic collaborations and expansion in lucrative untapped regional markets. Focus on regional markets such as Asia Pacific and Latin America has thus significantly increased. Some of the leading companies in the market are Sagent Pharmaceuticals, Pfizer, Inc., Fresenius SE & Co. KGaA, B. Braun Melsungen AG, LEO Pharma A/S, and Baxter International Inc. The report states that the market will exhibit a promising 6.4% CAGR over the period between 2017 and 2025, rising from a valuation of US$955.9 mn in 2016 to a revenue opportunity of US$1664.4 mn in 2025. Unfractionated heparin is chiefly manufactured from bovine- and porcine-based sources. Of these, the segment of porcine based heparin accounted for the dominant share in the global market in terms of demand served and revenue contributed. This can be mainly attributed to the large-scale ban on the use of bovine-based unfractionated heparin in Europe and the U.S. for the past many years. From a geographical standpoint, the market for unfractionated heparin in North America accounted for the dominant share in the overall market in 2016, mainly owing to the high prevalence of conditions associated with coagulation such as deep vein thrombosis and pulmonary embolism. Unfractionated heparin, a naturally occurring anticoagulant, finds extensive usage in surgeries such as such as coronary artery bypass grafting and for the prevention and treatment of conditions such as pulmonary embolism, deep vein thrombosis, and arterial thromboembolism. In the past few years, there has been a vast rise in the prevalence of such conditions and the numbers continue to rise at an alarming pace. While it is hard to find the actual number of people affected by these conditions globally, studies show that nearly 900,000 people are affected by deep vein thrombosis in the U.S. alone every year. As the condition necessitates the use of unfractionated heparin, its rising prevalence, along with the increased incidence rate of other diseases requiring the use of unfractionated heparin, are expected to significantly drive the market. The market for unfractionated heparin also benefits from the excellent functionality of the drug, its ability to get reversed, low cost, simple laboratory monitoring, and quick onset of action. The market for unfractionated heparin is also expected to be driven due to the rising demand across Europe and Asia Pacific as the geriatric population in these regions rises at a rapid pace. Moreover, the steady rise in the numbers of cardiovascular surgeries, which require unfractionated heparin as the preferred anticoagulant, is also expected to emerge as one of the leading driving factors for the market.